Field to Market's findings show improved environmental outcomes of crop production on an efficiency basis over past 36 years and highlight need for concerted efforts to drive continued improvements in sustainability performance for next decade. Commodity crop production in the United States continues to demonstrate improved environmental outcomes in energy use efficiency, irrigation water use efficiency, greenhouse gas emissions, land use efficiency, and soil conservation, while opportunities exist for key advancements into the future finds a report by Field to Market: The Alliance for Sustainable Agriculture released today. 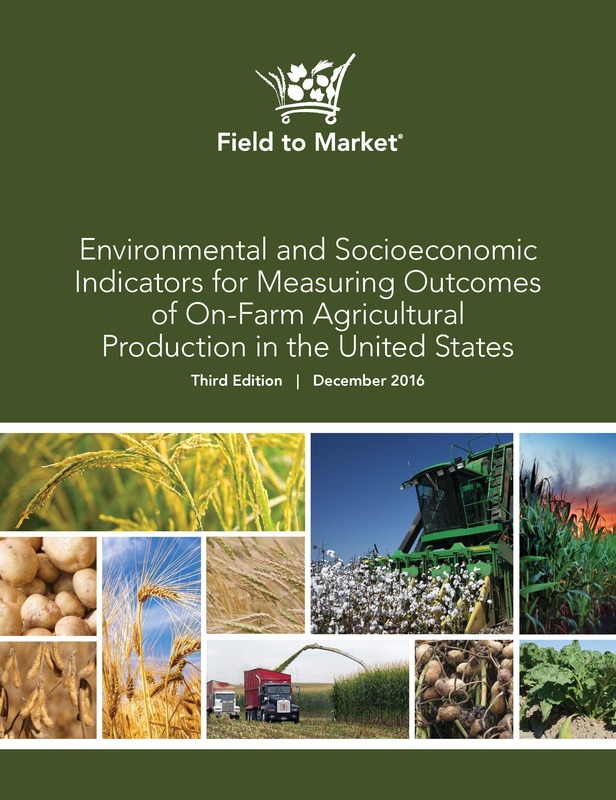 The third edition of Environmental and Socioeconomic Indicators for Measuring Outcomes of On-Farm Agricultural Production in the United States (2016 National Indicators Report) analyzes eight environmental indicators and five socioeconomic indicators for ten crops (barley, corn for grain, corn for silage, cotton, peanuts, potatoes, rice, soybeans, sugar beets, and wheat) over a 36-year period at a national level. Overall, the report finds promising results for the sustainability of commodity agriculture, with all crops demonstrating improved environmental outcomes with nearly every key indicator. This significant progress toward more sustainable food, feed, fiber, and fuel production is a result of a variety of factors including voluntary conservation efforts by farmers, public sector investments, and technological innovation across the agriculture industry. However, the report also highlights that long-term improvements are plateauing for several crops within the past five to ten years, presenting both a challenge and opportunity for the food and agriculture industry. This underscores the critical need for continued conservation investments, research, technological development and collective action from farmers and the food and agricultural supply chain to ensure continued improvements on challenging and pressing sustainability concerns. “At the core of these sustainability trends and improvements are millions of individual decisions made by farmers and land managers each day. By analyzing the aggregate impact of these decisions, this report underscores the critical role that farmers play in achieving improvements and delivering sustainable outcomes for agriculture and the environment,” shares Rod Snyder, president of Field to Market. “But there is more to be done; we recognize that this national assessment provides an opportunity to focus the efforts of the food and agricultural value chain to drive improvements where they are needed most. Field to Market remains committed to providing practical tools and resources underpinned by science-based metrics to help farmers and the supply chain continue to identify opportunities for improvements at the field and landscape level,” concluded Snyder. In addition to assessing sustainability performance by crop, the 2016 National Indicators Report also includes for the first time a national trends analysis for Biodiversity, Soil Carbon, and Water Quality. Due to lack of sufficient data and the nature of these environmental outcomes, it is not possible to calculate a national trend line by respective crop. The report finds that while limited trends can be discerned from available reports and scientific literature, translating these trends into actionable insights would require additional data and advances in scientific research. This edition of the report also provides an update on socioeconomic trends analyzed in previous editions. For more information on the report’s findings or to explore specific crops or indicators in greater detail, please visit: http://www.fieldtomarket.org/report. Field to Market: The Alliance for Sustainable Agriculture brings together a diverse group of grower organizations; agribusinesses; food, beverage, restaurant and retail companies; conservation groups; universities; and public sector partners to focus on defining, measuring and advancing the sustainability of food, fiber and fuel production. Field to Market is comprised of 117 members representing all facets of the U.S. agricultural supply chain, with members employing more than 5 million people and representing combined revenues totaling nearly $1.5 trillion. For more information, visit http://www.fieldtomarket.org and follow us on Twitter at http://www.twitter.com/FieldtoMarket. The 2016 National Indicators Report is a peer-reviewed report utilizing publicly available data, published government reports, and scientific literature, to measure sustainability trends of commodity crop production in the United States between 1980 to 2015. This edition of the report updates the national level indicators for Energy Use, Greenhouse Gas Emissions, Irrigation Water Use, Land Use and Soil Conservation. In addition, Field to Market includes the six crops previously assessed: corn for grain, cotton, potatoes, rice, soybeans, and wheat and adds four new crops in this edition: barley, corn for silage, peanuts, and sugar beets. The 2016 National Indicators Report also includes for the first time a national trends analysis of U.S. commodity crop production for three environmental indicators: Biodiversity, Soil Carbon, and Water Quality. As in the past editions of the report, Field to Market also considers socioeconomic indicators, and has condensed this assessment into five comprehensive indicators: Farm Financial Health, Farm Profitability, Generation of Economic Value, Worker Safety, and Labor Productivity. Press Release (PDF) Field to Market: The Alliance for Sustainable AgricultureLogo The third edition of Field to Market's National Indicators Report provides updated analysis on the sustainability performance of 10 crops over a 36-year period at a national level.